1 What is Captcha Entry Job? CAPTCHA entry job is one of the simple online work from home option for people who are looking to earn 3000+ INR per month by working at home in their free time. Earning of this job is not very good but the job is very simple. 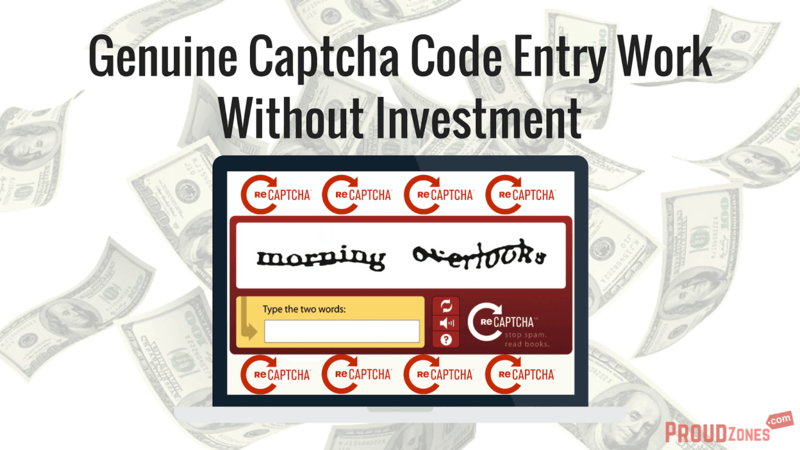 CAPTCHA code solving is one of the very easiest and most reliable ways to make money online. All you need is your PC or Laptop and a keyboard. There are so many CAPTCHA’s that cannot be recognized automatically and just as many webmasters ready to pay for solving them. They offer you service which collects such images in a single place and has neat interface for entering the text from them. Now you can simply look at text from the picture (CAPTCHA) and enter it. 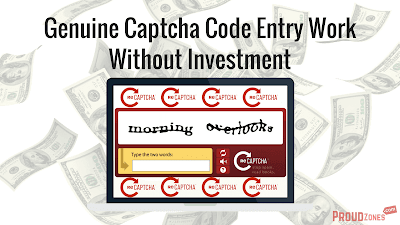 One of the most important requirements to earn good income from Captcha entry job is your typing speed. If you have typing speed of more than 40+ words per minute then you can earn better amount than others but if your typing speed is less then 20+ words per minute then, you are on the wrong track. There are millions of companies who need to sign up in large volumes on thousands of websites on internet every time of the day. They can create the automatic software to sign up on the websites but there is no technology to solve these captcha automatically so ultimately this is why they need humans to solve the Captcha codes. When their software creates accounts on these sites, they come across Captcha & send that Captcha image to the Captcha code solver(you). You have very short time to enter the exact characters provided in the image & you must have good accuracy to solve these images. 1. You need to create a PayPal account or Payza account before you join these sites so that you can receive your earnings. 2. If you make too much mistakes then they will disqualify you and you have to start again. 3. Some of the websites will ask you to download their software and you need to type the captchas after logged in to these software. 4. You must try all the websites up to minimum balance & check some of the things like who pays genuinely on time, where you are more comfortable to work & where you can make more money in less time. MegaTypers is a workforce management company that provides data entry services to private and governmental institutions. Their main goal is to support their client’s digitization requirements by converting scanned papers into editable digital documents. They’re currently looking for typers from all around the globe. All you need to have to work with them is a computer with an internet connection and the ability to type at least 10 Words Per Minute. Their schedules are flexible. Their top Typers earn between $100 TyperCredits and $250 TyperCredits each month! Their payment rates start from $0.45 TyperCredits for each 1000 word images typed, and can go as high as up to $1.5 TyperCredits for each 1000 words typed. Debit Cards, Bank Checks, Paypal WebMoney, Perfect Money, Payza and Western Union. Kolotibablo is one of the top international Captcha entry job providers. Kolotibablo.com has been providing online jobs from home from last 5+ years & many of the people have received their payment on time. They pay up to $1 or even more per 1000 captcha images you type correctly. Kolotibablo is very strict can ban the accounts of their worker if they found repeated mistakes or use of any other third party software. So, be careful while working in their site. ProTypers is a conglomerate of data entry specialists. They work primarily on converting scanned documents from images-to-text for institutions in all corners of the world. They also offer our services to Neural Network developers that work with image recognition, and provide visual assertive services for the visually impaired (blind). They’re currently looking for typers who have the ability to type at least 10 Words Per Minute. Bank Checks, Paypal, Debit Card, Web Money, Perfect Money, Payza. 2Captcha is a human-powered image recognition and CAPTCHA solving service. This is the hub for those who need their images recognized in real time and those who are ready to take this job. • You always have tasks to solve. Every day the service gets more than 1.000.000 CAPTCHAs to solve. • Quick earnings withdrawal, automated payments. • They charge no commission on your earnings. • Referral program: earn additional 10% from your referrals. FastTypers are very strict. Before you join FastTypers, you need to request for admin account. • A copy of utility bill (electricity, GAS, Phone bill etc.). • Primary phone/Mobile number, include an alternative number if available. These are the 5 best highest paying genuine captcha code job websites in 2017. These online part time jobs are very easy to do and the best part about this is, anyone can start making money without investing any money. If you like this post, don’t forget to like,comment and share it on Facebook & Twitter and also do subscribe to our newsletter to keep receiving updates.